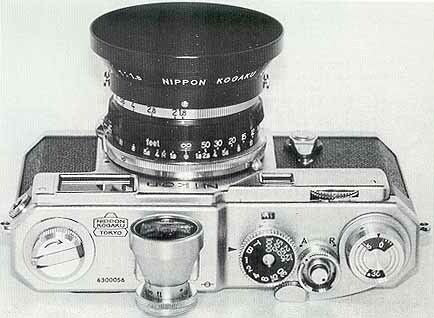 By January 1956 Nippon Kogaku had completed the research and development of what would prove to be the fastest wideangle lens produced for their system, and one of the sharpest ever made for an interchangeable lens 35mm RF camera. 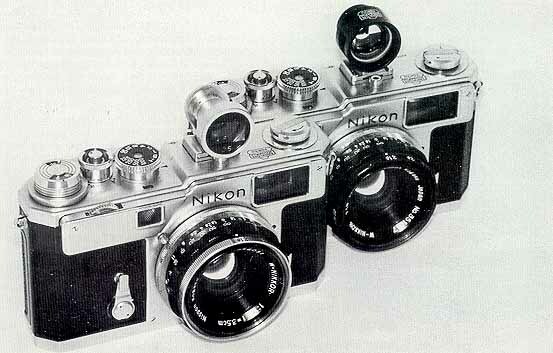 By September 1956 it was ready and the first announcements were made for the all new 35mm/fl.8 Nikkor! The optical construction of this new lens was made possible by modern research and the use of rare earth "lanthanum" glass. It consisted of seven elements including an overly large rear group and a front element large enough to cover fl.4! This resulted in a lens with very little vignetting and a high degree of evenness of illumination for the period. It also provided an unusually flat field and excellent correction despite its fast speed. By all standards of the time, the 35mm/fl.8 Nikkor was a very modern lens, and undeniably the best wideangle Nippon Kogaku made during the rangefinder era. lens that would benefit from the new design would be the last version of the 35mm/f2.5, which even looks like the fl.8 right down to the same diaphragm ring! Whatever the reason, Nippon Koqaku chose not to use this more modern design for the remainder of the RF era. 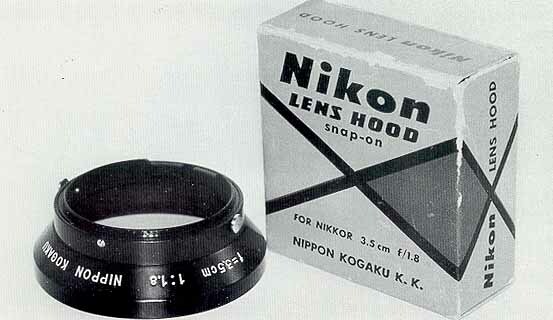 However, by 1959 they obviously had changed their minds, for all the Auto-Nikkors that were released with the Nikon F used this new focusing ring! The serial numbers for the 35/fl.8 began at #351801. it is obvious that instead of using the date to start the number, Nippon Kogaku chose to use the focal length (35) and the speed (18) to come up with "3518xx" for this lens. Since they usually started their numbers with "Ol" and not "00", the first lens would be, and was, #351801. To date numbers up to 360079 have been reported for a possible production of 8,000 plus units. There are two distinct variations available, although the difference in only in the barrel. When this lens was first released it came in a completely black barrel, save for the mounting ring at the rear. 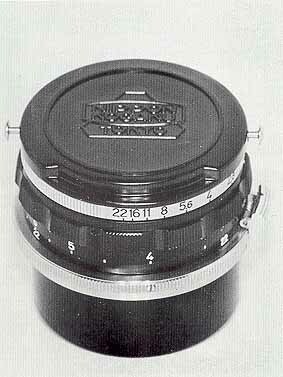 Even the unique diaphragm ring (more later) was painted black on this first version, which is the one pictured in most of the literature produced by Nikon. To date these all black lenses have been reported between the first lens, #351801, and #351859, or 58 units! Lens #351875 has been verified to have a chrome ring and no lenses with black rings have been reported after #351875. 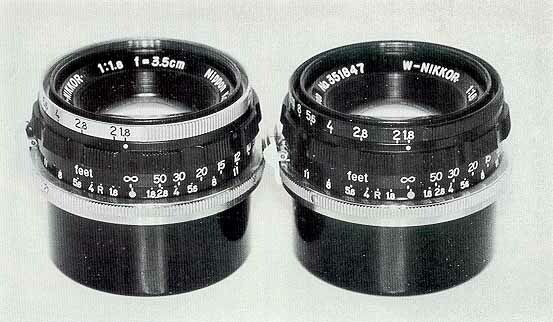 Therefore, it is probable that less than 75 all black 35mm/fl.8 lenses were made! Although it is a handsome design in all black, it may have become obvious quite early that it was not durable. The ring appears to be simply black painted brass, and some surviving examples show that it wore off easily. Whatever the reason, by lens #75 they changed it to a brightly finished chrome that was toned down a bit as time passed. The earlier bright ring may have been prone to flare, which the black ring never would have caused. 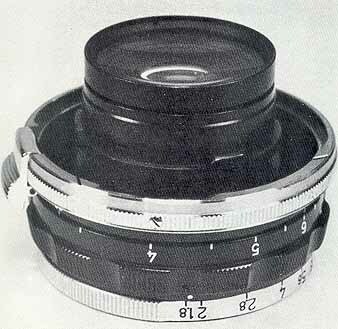 The configuration of the diaphragm ring was unique to this lens (until it was adopted for the later redesigned 35/f2.5), although a similar style was used on the 21mm three years later. This lens took the same 43mm filters as most lenses in the line. However, it took a 48mm cap which used threads on the inner surface of the diaphragm ring and riot the threads used for the filters. 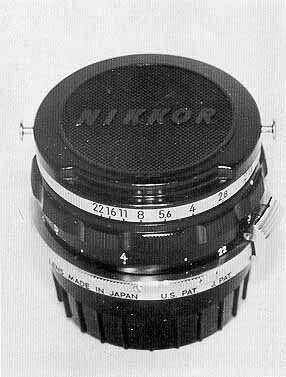 it also required its own 48mm snap-on shade that fits no other wideangle Nikkor. 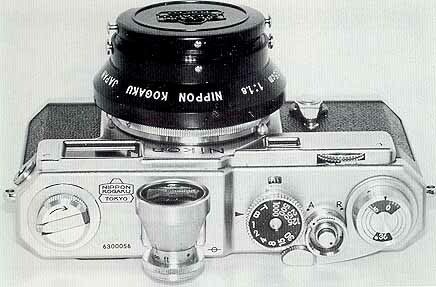 Because of its deep-set rear element, it used the same "WW" rear cap as the 25mm Nikkor. 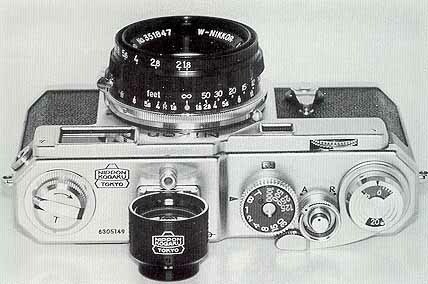 The top photos illustrate the two basic variations found in the 35mmfNikkor.l.8 Nikkor. On the left is an example of the very first production run of which probably less than 75 units were ever made! Beginning with the first lens, #351801, this type has been verified up through lens #351859, or 58 pieces! The rather obvious difference is the black painted diaphragm ring, which was unique to this lens until the release of the 21mm/f4 and the redesigned 35mm/f2.5. The lens on the right is also quite early, but it now has the more familiar chrome diaphragm ting found on all lenses reported after #351875. Note that, save for some slight engraving differences, these two lenses are identical. In this author's opinion the black ringed version is more handsome than the chrome type, and easier to read under most lighting conditions. Would not Nippon Kogaku shortly change most of their lens tine to more modern black barrels which, although lighter, were also hailed as easier to read than the older black lettering on chrome However, from a practical point of view, it may have been that the painted ring would not hold up with use and was discarded For its speed, the 35mm/f1.8 was not an overly large or heavy lens When mounted it was not much larger than its slower f3.5 and f2.5 siblings and added very little bulk over the standard 50mm/f1.4 lens It could easily be left on the camera permanently and, as a matter of fact, the cameras were sometimes advertised with this lens as a substitute for the normals This was during the period of time when many people used a 35mm in place of a 50, & this lens was fast enough! The 35mm/f1.8 Nikkor is an inherently compact lens but it is obvious that some of this size advantage was lost with the addition of the auxiliary finder and the shade Although the finder was not necessary after the arrival of the SP/S3 type cameras it was needed by users of the S2 and earlier cameras Also, it is possible the many users reverted back to a separate finder once the black brightline type became available. Yes the SP has its tiny 28/35 finder, but the view though the brightline finder is superb, and even the S3 finder does not match up! 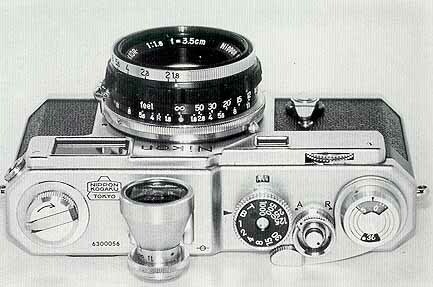 For ease of use and overall brilliance the brightline were vastly superior to those built into the camera bodies. 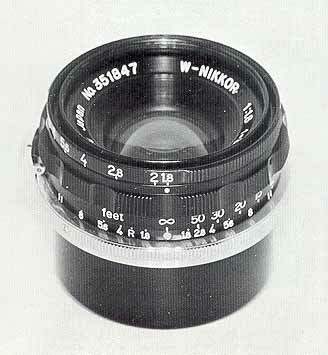 The shade for the 35mm/f1.8 Nikkor is unique to this lens Because of its 48mm attachment size, it will fit no other wideangle lens in the Nikon tine. The only other Nikkor with a 48mm filter thread is the 85mm/f2 which would have no use for this shallow shade. So the shade for this lens is specific and is so marked. It is of the modern black snap-on reversing type, with no screw-in version known to this author. Slightly different engraving variations probably exist but the basic design remained unchanged. 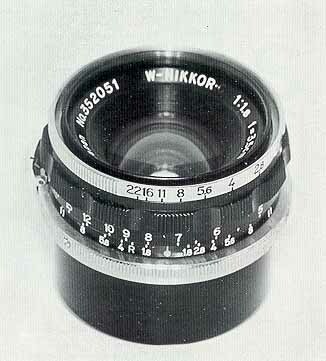 Because of its deep set rear group the 35mm f1.8 Nikkor requires the same rear cap used on	the 25mm lens! Both the 28mm and the other 35s take a shallower cap. It was made in two types with the earlier being black metal and the later molded black plastic. 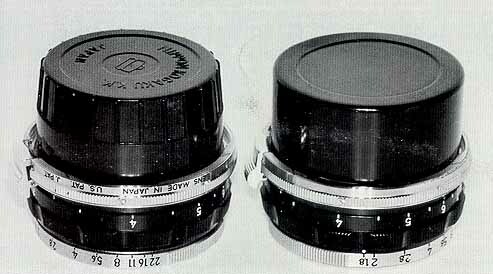 The 48mm 6nap-on black plastic front cap was also made in two versions. The earlier type has the N-K triangular logo in the middle as do all the lenses from the same vintage. 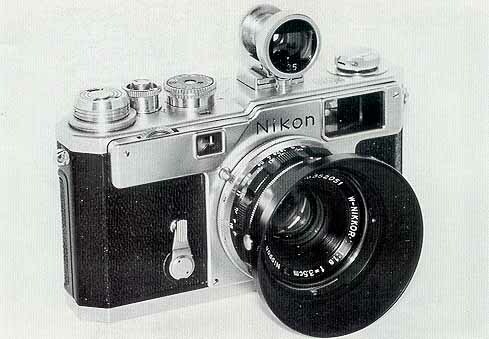 Later the design was modernized and the logo was replaced with large letters spelling "NIKKOR".